Why Presta? 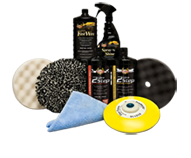 Because Presta is the finest in finishing products, and offers the best service in the industry. At Presta Products, we understand the value of experts when educating people about products and training staff on important "how-tos". That's why we're proud to introduce you to Presta’s Professional Sales and Technical Representative Team. With over 100 combined years of automotive, sales and training experience, you can be sure you'll have the right team in place to help you and your customers learn about the best products and techniques for the finest in automotive care. Contact us today and Put Presta to Work for You!